In February 2015, the IRS issued final forms and instructions related to the Affordable Care Act (ACA). 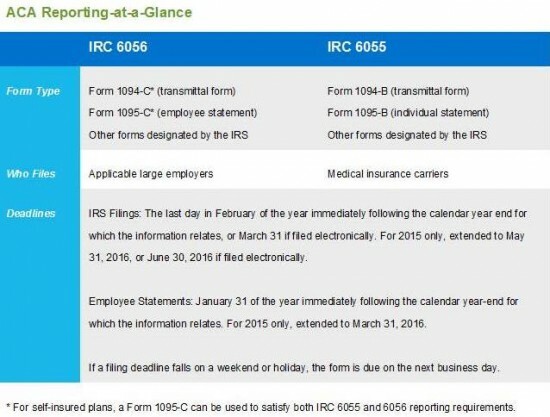 Back in December, 2015, the IRS issued a deadline extension for the new ACA reporting requirements. For tax year 2015, employers and insurance carriers are required to report medical coverage data under Internal Revenue Code sections 6056 and 6055. Below is what you need to know to decide what you need to report and what form to use. The chart above is a handy reminder of the deadlines to file this paperwork. An ALE is a company that employed 50 or more full-time employees, including full-time equivalent employees (FTEs), on average during the previous calendar year. Generally, a full-time employee is someone who works 30 or more hours a week, on average. Internal Revenue Code section 6056 applies to companies that meet the definition of an ALE, including companies that did not offer group medical coverage in 2015. TriNet encourages all companies that fall into this category to brush up on our previous information about ALEs and their ACA reporting requirements. It is important to note that the IRS will impose penalties on ALEs that fail to make a good faith effort to furnish the forms in 2016, which will report offers of coverage in 2015. Failure to do so results in a penalty of $100 per statement, up to $1.5 million each calendar year—unless the ALE intentionally disregards the requirement. In that case, there is no maximum penalty. It is important to note that the IRS allows an ALE to use a third party to help with the preparation of the reports. TriNet, for example, offers ACA reporting assistance to our clients. Once you’ve figured out that you are an ALE, your first concern should be in sending to all your full-time employees – and to the IRS - information about the medical coverage, if any, your company offered in 2015. All ALEs are required to report 2015 coverage information in early 2016 (see chart above for specific deadlines), including ALEs with 50-99 FTEs who qualify for ACA employer shared responsibility transition relief for 2015. ALEs must provide IRS form 1095-C to each full-time employee who was employed during the 2015 calendar year. This form is required to help the IRS determine employee eligibility for premium tax credits if the employer does not offer affordable and compliant health coverage as defined by the ACA. The share of the lowest cost monthly premium for employee-only coverage providing minimum value offered to full-time employees under an eligible employer-sponsored plan. If a plan is self-insured, information about coverage dependents. What defines minimum essential coverage (MEC)? MEC includes employer-sponsored medical plans, as well as coverage under government-sponsored plans, individual market plans and other types of coverage recognized by the U.S Department of Health & Human Services. All TriNet medical plans are MEC. If applicable, the names and EINs of companies that are members of the aggregated ALE group (controlled group). Any other entity that issues MEC. For instance, if a medical plan is fully insured, the insurance carrier is responsible for filing the applicable section 6055 reports to the IRS and distributing statements to covered employees. These rules don’t apply to supplemental health plans, such as a health savings accounts or health reimbursement accounts. How should ALEs distribute statements to employees? Under both sections 6056 and 6055, employee statements may be distributed electronically or via paper. However, to distribute electronically, employees must consent to receiving electronic delivery. Many small businesses are following the ever-changing regulations of ACA and are still struggling with how to maintain compliance, especially with the new reporting requirements. TriNet spends our time closely monitoring the ACA so you don’t have to. We have the resources and expertise to take much of the burden off employers. Contact us for more information about staying compliant with ACA rules and regulations. TriNet is the single-employer sponsor of all its benefit plans. This communication is for informational purposes only; is not legal, tax or accounting advice; and is not an offer to sell, buy or procure insurance. Click here for the full disclaimer.